Since 1992, 19 people have died as the result of accidents involving snow blowers. Two people were killed because they were caught in the machine. Five more lost their lives due to carbon monoxide poisoning from allowing the motor to run in a closed space. 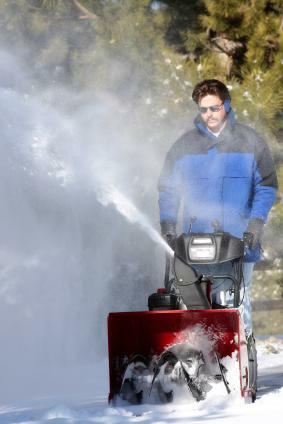 Every year, over 5,700 people are treated in hospital emergency rooms for injuries related to using snow blowers. Most snow blower injuries occur when the operator has been attempting to clear the collector or discharge chute with his or her hands while the machine is still running. Inspect your snow blower thoroughly before each use. Part of following snow blower safety rules involves keeping the machine in good repair, so make a point of ensuring the machine has enough oil and that its tires are inflated properly before use. If you are using an electric snow blower, check the cord to make sure that it hasn't become frayed or damaged. Before you use a snow blower for the first time, be sure to read the manual thoroughly. Even if you have used one of these machines before, there may be specific instructions that pertain to that particular model. It's a good idea to review the manual before the first time you use the snow blower each winter to refresh your memory about the proper way to operate it. The shields that come with a snow blower are an important safety feature, and they should be kept in place. Keep your hands away from the moving parts when the machine is in operation. If you need to clear a blockage in the machine, shut it down first. Use a long stick to dislodge any snow or debris before you start it again. Do not start the snow blower in an enclosed area. Always move it outside before you hit the start button. Keep in mind that the snow blower will pick up rocks, chunks of ice and other objects off the ground while in use. Consider the direction where the discharge chute on the machine is pointed before you start using it. Make sure that you replace the cap on the gas can after use. Store the fuel in a secure location, away from any materials that may ignite it. Don't add fuel to a hot engine. Always fill the gas tank before you start using the machine. If you are using an electric snow blower, you need to make sure that you know where the cord is while the machine is in use. You may need to stop periodically to move the cord out of the way before you can continue working on another section of your driveway or sidewalk. The electrical cord is a potential safety threat. If it becomes caught in the machine and is severed, you could receive a shock or be electrocuted. Snow blower safety is something that everyone operating one of these machines needs to keep in mind. They offer a relatively quick and convenient way to remove snow from driveways and sidewalks, but anyone who is planning to use one must exercise caution to make the process as safe as possible.